When you want a fast and easy way to take advantage of the many health benefits that fresh fruits and vegetables have to offer, green smoothies are an excellent solution. These smoothies are not only high in essential nutrients, but they are also naturally low in calories and these homemade drinks offer a natural and healthier juice than commercially prepared products. There is a good amount of water in green smoothies as well as fiber and other nutritious ingredients that can help your body shed toxins throughout the day. Additionally, many of these healthy green smoothies also contain substances that will actually help suppress your appetite, so they provide an excellent weight loss benefit. 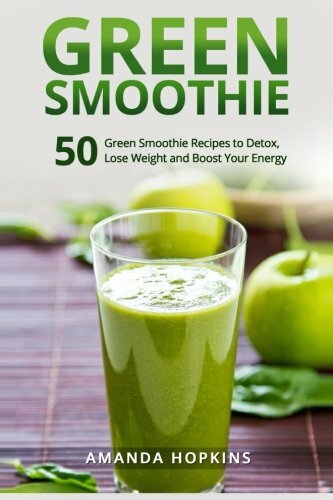 It doesn’t matter if you’re a beginner or an experienced drinker of green smoothies, this book offers a great selection of new ideas that you’ll want to try. A big hurdle in making green smoothies is trying to decide what type to make and how to go about doing it. Fortunately, this book answers these questions and provides an easy guide to take you through the entire process. You’ll find tips, recipes and helpful tricks in the book, allowing you to move from novice smoothie maker to expert in very little time. If you want to enjoy the benefits of a more balanced diet, find a great alternative to sugary drinks or even lose a couple of inches, order this informative book today!